PLEASE DO YOUR BEST TO ATTEND THIS MEETING AT THE LLDC OFFICES, STARTING AT 6PM. There have been objections from local residents and various organisations but the application is supported by the GLA, LBTH, Canal & River Trust and Historic England. PLEASE READ THE FOLLOWING BRIEFING NOTES ABOUT THESE FOUR MAJOR SUPPORTERS. THEN READ THE STANDARD LETTER, AND YOU WILL REALISE THAT HUNDREDS OF THESE NEED TO BE SENT ASAP TO ACHIEVE A POLICY-COMPLIANT DEVELOPMENT ON THIS LARGE SITE (IN THE MOST ATTRACTIVE PART OF THE CONSERVATION AREA) AND SAVE THE CONSERVATION AREA FROM BEING DEVELOPED OUT OF EXISTENCE. HISTORIC ENGLAND had raised concerns about the height of the two long residential blocks along the west side of the Hackney Cut; and the scale and design of the employment building on Dace Road. The minor amendments (referred to in the second part of the previous newsletter AMENDED DETAILS: BREAM STREET) were presumably designed to address these concerns, and we understand that HE has accepted these minor alterations. The gardens etc. behind the two long residential blocks on the canal will also have new tall buildings to the west and will probably be in full or partial shadow for most of the day and early evening. Of all the London planning authorities, the GLA, in particular, should be upholding the Mayor of London’s Blue Ribbon Network Policies. But the northern of the two canalside blocks is very close to the west bank of the canal, and will have large projecting balconies; and none of the 21.8% of affordable homes will be in the two canalside blocks. LONDON BOROUGH OF TOWER HAMLETS objected to the low percentage of affordable housing (in its 4 September 2015 letter) and noted that this is under review by an “independent viability consultant” (local residents have been told by the case officer that this and other consultants’ reports would not be made available to the public, but will be referred to in the case officers’ report). 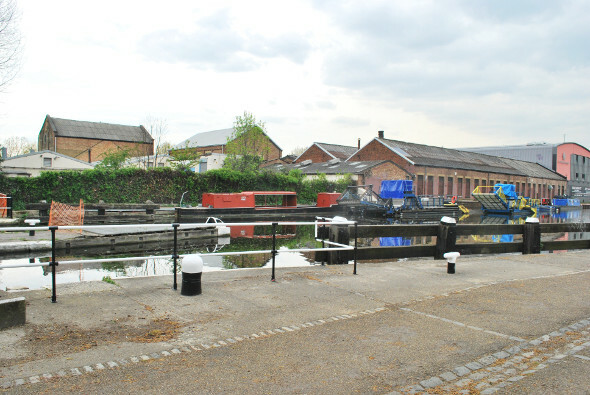 With regard to the proposed buildings along the canal, LBTH is only concerned about detailing and quality of materials; and states that their scale and mass is “akin to the traditional warehouses which are characteristic of this area”. Mainly on the basis of this completely false statement, LBTH concludes that the “proposed development does not detract from existing local heritage assets such as Swan Wharf and Old Ford Lock, character significance and the overall significant values of the Fish Island and White Post Lane conservation area”. As to LBTH’s tall “traditional warehouses” in the Fish Island & White Post Lane Conservation Area, there is only one six-storey factory building (the former chocolate factory in White Post Lane, which is a short distance from and at right angles to the Hackney Cut): most of the tallest surviving industrial buildings are no more than four storeys in height, and none of them are as long as the proposed 6/7 storey canalside blocks. 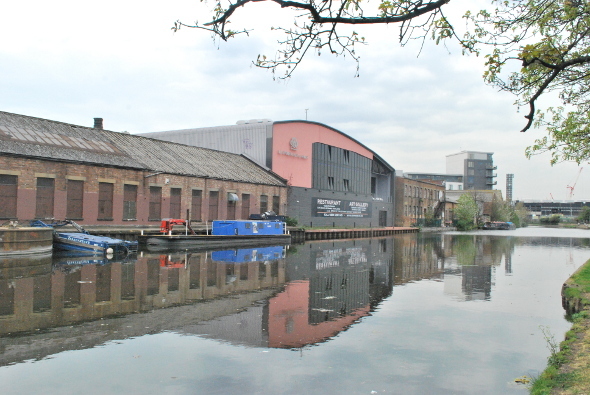 As set out in the EEWG letter of 25 July 2015 (HISTORICAL BACKGROUND; DISTRIBUTION OF TALL BUILDINGS), the industrial buildings along the Hackney Cut and the Hertford Union Canal were mostly single-storey and two-storey buildings; and the ‘sense of open space’ which characterised these canals will be completely destroyed by the proposed development at Bream Street. The area now occupied by the application site was included in the southern of two potential conservation areas identified in a Survey of Built Heritage Resources: commissioned by the Olympic Delivery Authority as part of its Olympic Applications Environment Statement January 2004. LBTH’s 2008 Fish Island Conservation Area was much smaller than the ODA’s potential conservation area and excluded the area now occupied by the application site. However, the 2008 character appraisal included a list of buildings of townscape merit (outside the conservation area) which included the three most interesting buildings in the area now occupied by the application site. Unfortunately, the three buildings of townscape merit were demolished for a failed Olympic Hospitality Venue. Even so, the important canalside site was to be included in the LLDC’s enlarged Fish Island conservation area but the cleared area was removed at the request of the owner. Nevertheless, the southern part of the application site is in the Fish Island & White Post Lane Conservation Area and it is bounded to the east and the west by the conservation area. East End Waterway Group, The Victorian Society, SAVE Britain’s Heritage, Greater London Industrial Archaeology Society and The Regent’s Network have all objected to the planning application on the grounds that it would seriously harm the significance of the conservation area and its setting. However, the LLDC is clearly minded to recommend approval to its planning committee so we urgently need as many individuals and groups to send the STANDARD LETTER as soon as possible. Make the necessary alterations where there is an I/We, put your full postal address in the top right hand corner with the date; and your name(s) after “Yours sincerely” (and/or your signature(s) if your letter is being sent to the LLDC by post. 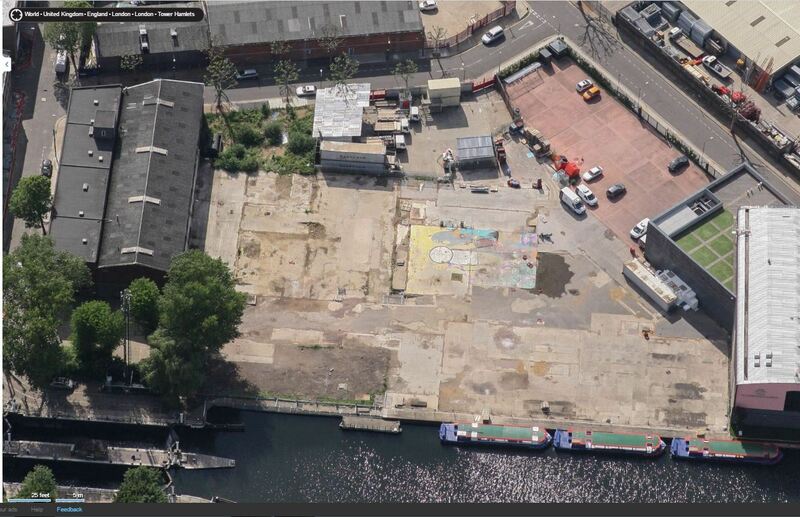 We understand that the applicant at Swan Wharf has now decided to postpone the application for about twelve months. As you know, the applicant wants to demolish most of the three-storey stable block. This threat to one of the conservation area’s most important non-designated heritage assets is now joined by an application for a major site on the other side of the road from the stable block, and alongside the Hackney Cut. The applicant, London & Quadrant Housing Trust, wants to erect seven buildings, including a slightly set-back very long seven-storey residential block overlooking Old Ford Locks; and a very long six-storey residential block overlooking the Hackney Cut. Old Ford Locks and the Hackney Cut are in the conservation area and its significance would be seriously harmed by both blocks. Their height must be reduced to four storeys and other changes made to preserve the important “sense of space” along the most attractive waterside area in the conservation area. We are also very concerned about the proposed five-storey, metal-cladded block on the north side of Dace Road, opposite the three-storey stable block. Please read the attached letter of objection, bearing in mind that the Design & Access Statement is 140 pages long. Your correspondent regrets that for several reasons it was not possible to prepare and distribute copies of the letter well before the ending of the consultation period on 26 July. Also, please remember that although the letter has been written on behalf of the group, it only represents one objection. So please read the letter and look on the website here and write your own letter of objection along the same lines. Late letters are normally accepted so long as they are sent in as soon as possible. An LLDC team has been working on excellent plans for a neighbourhood centre around Hackney Wick Station. The plans involve the retention and reuse of five non-designated heritage assets in Wallis Road in the Hackney Wick Conservation area; and four in White Post Lane in the Fish Island & White Post Lane Conservation Area. Your correspondent was unable to attend the public exhibition held 15-18 July but was invited to meet three members of the team on 23 July. The team hopes to submit a planning application in the autumn but their discussions with developers have already resulted in a planning application for a development at the western end of Wallis Road. This includes the retention and reuse of the Rubber or Parkesine Works, which is mostly made up of the oldest industrial buildings in Hackney Wick and Fish Island. As reported in the June Newsletter, your correspondent wrote to National Grid plc. Jim Moore, the plc’s Joint Venture Manager for Commercial Property emailed back on 17 June suggesting we arrange a meeting when the Secretary of State issues a Certificate of Immunity for the two historic gasholders (preventing them from being listed for five years). 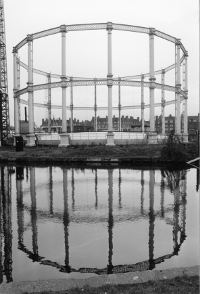 A piece by Sean O’Hagan in The Observer (14.06.15 The New Review) entitled GASWORKS WONDERS included a photograph of the No.5’s lattice girder guideframe reflected in the waters of the Regent’s Canal. 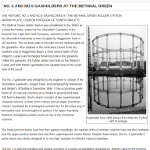 Thanks to Bob Carr (Council Member of the Association for Industrial Archaeology) your correspondent’s note on the two historic gasholders at Bethnal Green appeared in INDUSTRIAL ARCHAEOLOGY NEWS 172 Spring 2015, with Malcolm Tucker’s photograph of the No. 2’s columnar guide frame partly reflected in the waters of the Regent’s Canal. The application (14/00262/FUL) will not be going to the LLDC planning committee in June as previously understood. Nor in July or August (committee does not meet in August), so September is a possibility. Discussions with English Heritage are still ongoing and we understand that the applicant is obliged to “overcome” English Heritage’s objection to the demolition of the multi-storey stable block. According to the case officer, Rachel Gleave, the applicant may decide to continue with the current, slightly amended, application, in which case officers may recommend approval. On the other hand, the applicant may decide to withdraw completely or withdraw and submit a new application, which would be subject to consultation. Application 14/00387/FUL was approved unanimously by the LLDC planning committee at its meeting on Tuesday, 26 May 2015. The committee visited the application site earlier in the day and was briefed on The Hackney Wick Masterplan, which seeks to retain all the other non-designated heritage assets in the area covered by the masterplan. Only six members were present, probably because of half-term. Alison Dowsett MD St William Homes LLP has kindly replied to our letter published in the May newsletter. She would be pleased to meet us but points out that the site is still owned by National Grid; and suggests we contact Jim Moore or Phil Edwards. Your correspondent has therefore thanked Alison Dowsett and sent the same letter to [email protected] and [email protected]). Despite extending the ‘industrial’ conservation areas in Hackney Wick (LB Hackney) and Fish Island (LB Tower Hamlets) and identifying industrial buildings and structures both inside and outside the conservation areas as non-designated heritage assets, the LONDON LEGACY DEVELOPMENT CORPORATION is implementing its Local Plan 2015-2031 policy to restore and reuse buildings of heritage value for employment uses by allowing developers to either demolish such buildings or, at best, keep a few original outer walls as decoration for an oversized replacement building. An application to simply retain two outer walls of an Edwardian multi-storey stable block at Swan Wharf, Dace Road, London E3 attracted over seventy individual objections, including representations from English Heritage, The Victorian Society, East End Waterway Group, Greater London Industrial Archaeology Society, The Hackney Wick and Fish Island Planning and Development Unit, The East End Preservation Society, Heritage of London Trust, SAVE Britain’s Heritage. Also 1,041 signatures to an online petition (see below). The Legacy Corporation postponed the determination of the application to discuss amendments with the applicant. The main amendment now being consulted on is the reduction of the proposed oversized replacement block from six to five storeys. Both the Legacy Corporation and the applicant are ignoring all the objections and the strong advice from English Heritage. And the LLDC’s Fish Island & White Post Lane CA Character Appraisal and Management Guidelines (adopted by the Board in April 2014, final version November 2014). And the LLDC’s Local Plan 2015-2031 (submitted to Secretary of State November 2014). They are also ignoring all other relevant planning policies: National Planning Policy Framework, London Plan, LBTH Core Strategy and LBTH Fish Island Area Action Plan. 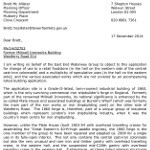 Obviously, should planning application 14/00262/FUL be given planning permission by the LLDC’s Planning Committee (at its February 2015 meeting?) and the proposed demolitions in Wallis Road Hackney Wick are allowed, precedents would be set for the demolition of substantial demolition of all the other non-designated heritage assets (unlisted buildings) in and outside the LLDC’s four conservation areas. In which case, the designation of the two extended conservation areas and all the LLDC’s planning policy documents would have been a complete waste of time, effort and money. And the people of London (Tower Hamlets and Hackney in particular) would not only lose the one really substantial remaining historic area of the Lower Lea Valley (which was London’s largest industrial area when London was the world’s largest industrial city and greatest port) but also the social and economic benefits of properly retaining and reusing its representative buildings. The on-line petition objecting to planning application 14/0262/FUL has so far been signed by 1041 people. If you haven’t already signed, please do so as soon as possible and encourage others to sign. The petition will be kept open until the day the application goes tot he LLDC Planning Committee. 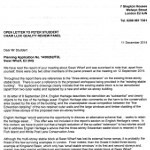 Letter of Objection from EEWG re proposed demolitions of heritage assets in Wallis Road. As this will only count as one objection, please send your own objection and encourage others to do so as soon as possible. The consultation period ended in December 2014, but objections will still be received by the LLDC until the application goes to the LLDC Planning Committee. All you have to do is put your full postal address on the letter and make the few changes necessary so that the email letter is from you. Thank you for the opportunity to comment on the amended details. The proposed retention of the stable block’s north-side wall and west-end wall does not constitute the “redevelopment and retention of the heritage asset” (Revised Planning Statement p.36). The applicant is still seeking planning permission to substantially demolish the non-designated heritage asset and replace it with a wider five-storey building, instead of a six-storey building. The deception that the heritage asset is to be kept and reused is maintained by references to “partial demolition” and “extensions above” (LLDC description of proposal); references to “stable block core” and “main stable block” (Revised Planning Statement p.4); and references to “stable block extension” (Design and Access Addendum Report 4.2.04). 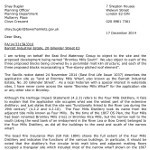 EEWG’s first letter of objection (26 August 2014) explains how the NPPF, London Plan, LBTH Core Strategy and Fish Island Area Action Plan would be contravened by the proposal to simply retain two outer walls of the heritage asset. The proposal would also contravene the LLDC Local Plan 2015-2013 (submitted 21 November 2014 to the Secretary of State with minor amendments and corrections). Whilst it has still to be examined in public and adopted, the Local Plan is clearly an emerging plan and is, therefore, a material consideration in the determination of this application. We refer specifically to Local Plan “Policy 1.1.3 Restore and reuse buildings of heritage value for employment uses”. Conservation by grant-funding etc. not applicable. Most of the site, in conformity with area priorities and policies as set out in the Local Plan, is currently and fully in appropriate employment use. 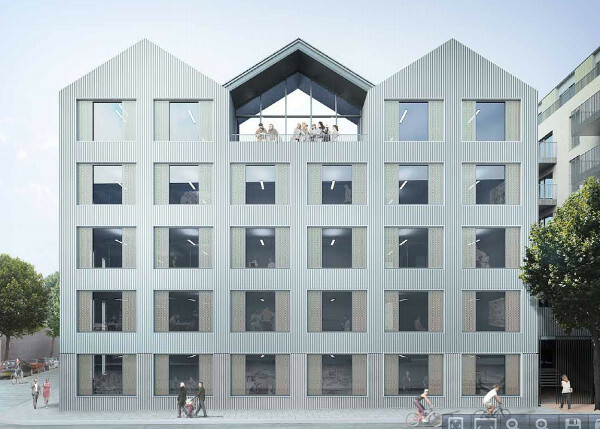 The proposed reduction in the height of the replacement block from six to five storeys utterly fails to address English Heritage’s advice that the three-storey Edwardian stable block is retained in the Fish Island & White Post Lane Conservation Area. 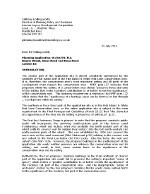 We note the deliberate omission of any reference to English Heritage’s letter of 8 September 2014 in Section 2 of the Design and Access Addendum Report. English Heritage describes the demolition as “substantial” and clearly objects to the loss of the heritage asset and the harm to the conservation area caused by this loss. English Heritage also refers to the unacceptable visual competition between the “fine Edwardian detailing” of the two retained outer walls and the large windows and timber cladding of the upper three storeys (now two) of the proposed new six-storey building (now five). 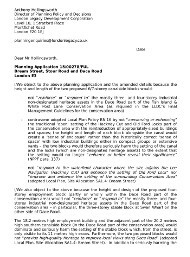 For all the reasons set out in this third letter of objection and our earlier letters of objection of 26 August and 8 September 2014 and for all the reasons set out in the online petition (currently signed by 1041 people), East End Waterway Group objects to Planning Application 14/00262/FUL and expects this application to be refused by the LLDC Planning Committee; and the applicant encouraged to take up English Heritage’s offer “to discuss an alternative scheme that … seeks to retain the heritage asset…”. Would organisations and individuals with media contacts please send this newsletter/press release with your endorsements, and let us know. 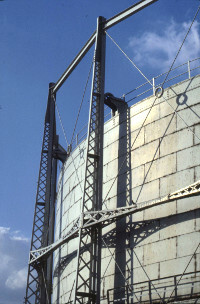 We have just heard that National Grid has applied to English Heritage for both historic gasholders at Bethnal Green to be given a CERTIFICATE OF IMMUNITY against national listing. 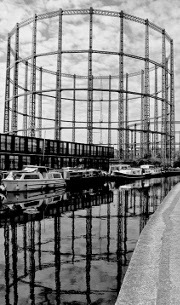 Without the protection of national listing, both gasholders can be demolished, although they are in the Regent’s Canal Conservation Area.English Heritage is considering the application and there will probably be an opportunity for experts to comment. 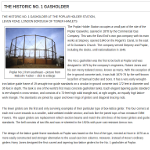 Even so, English Heritage has already issued a number of certificates relating to historic gasholders in London.National Grid plans to demolish all gasholders at Bethnal Green (including the two historic gasholders by the canal). And all the gasholders at Poplar (including the historic gasholder by the River Lea). According to the Tower Hamlets Managing Development Development Plan Documents (DPD), the sites of the two historic gasholders at Bethnal Green (and the sites of some gasholders at Poplar) are to be laid out by developers as new parks next to new residential developments. The DPD was examined in public by a planning inspector in September 2012.Tom Ridge represented the East End Waterway Group at the public examination and outlined EEWG proposals for retaining the three historic gasholders in the new parks. A senior officer in the parks department stated that the proposals were feasible; and the inspector asked planning officers about a form of words to allow these proposals. But the Council’s QC advised against such words being included in the DPD. This was finally approved by the inspector and subsequently formally adopted by Tower Hamlets Council. EEWG’s proposals have been incorporated in 2 online petitions to National Grid and Tower Hamlets Council. Please read the attached notes, study Malcolm Tucker’s photographs and sign both online petitions to save the historic gasholders at Bethnal Green and Poplar. At the public examination, Tower Hamlets Council wanted National Grid to demolish all the gasholders in 2014, so we must try and save the historic gasholder at Poplar at the same time as the two at Bethnal Green. Especially as an application for a Certificate of Immunity relating to one or more holders at Poplar is either in the process of being made or is likely to be made in the near future. Please sign both petitions as soon as possible and encourage others to do the same. Although the London Legacy Development Corporation’s further consultation ended on 21 February we have decided to continue with the attached petition, safe in the knowl edge that it will be accepted by LLDC as the local planning authority. The goal is 1000 names so please do your best to encourage others to sign as well and as soon as possible. We, the undersigned, ask that the reference to Hackney Wick South is dropped from the proposed name for the extended conservation area in LB Tower Hamlets, that both conservation area documents are completely accurate; and support the request from the East End Waterway Group (EEWG) for the London Legacy Development Corporation (LLDC) to locally list two buildings at 10 Stour Road. The former works at 10 Stour Road was occupied from about 1953 to 1984 by printing machine and press manufacturers, Frank F Pershke Ltd. The two most important buildings are the two-storey c.1900 factory on the west bank of the Hackney Cut, and the two-storey-high engineering workshop on the corner of Stour Road and Beechy RoadThe c.1900 factory suffered general blast damage on 21 July 1944 when a VI flying bomb landed a short distance to the east in Glikstens’ timber yard. The factory was repaired and reinforced for Pershke Ltd. by the insertion of a very unusual reinforced concrete frame: with a concrete floor at first-floor level and a narrow flat concrete roof between timber roof slopes. The engineering workshop with its exposed reinforced concrete frame and steel gantry beams was built for Pershke Ltd. An overhead travelling crane on the gantry beams was used to assemble the machines and presses. 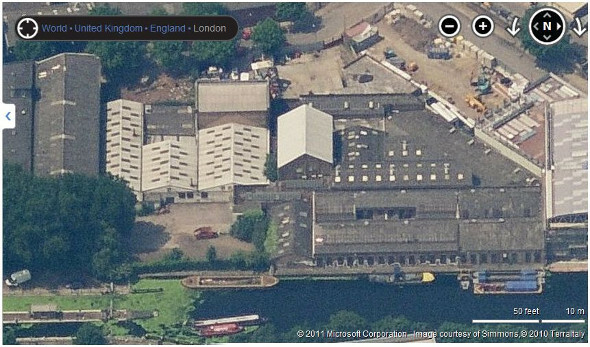 The former workshop is now a rare and important surviving example of its type in London. The significance of both buildings is enhanced by the proximity of three purpose-built late-19th-century / early-20th-century printing works in Fish Island; a 19th-century works used by a Shoreditch-based printers from about 1907 to 1924; and a purpose-built early-20th-century printing works in Hackney Wick. The last two newsletters were about the London Legacy Development Corporation’s public consultation on the proposed extensions to the existing Fish Island CA and the Hackney Wick CA. On 24 January 2014, the LLDC announced a further consultation and published the two Conservation Area Appraisals and Draft Management Guidelines for comment. Many organisations and individuals wrote in support of the extended conservation areas but there were also many objections. Please read the long attached letter I have written on behalf of EEWG; and please do your best to write again. This time, EEWG objects strongly to the extended conservation area in LB Tower Hamlets being named Fish Island & Hackney Wick South. Also, given the obvious necessity for conservation area documents to be accurate, I have felt compelled to correct the many errors. The deadline is 21 February 2014. My apologies for not writing sooner but I have been revising a long extract from EEWG’s forthcoming East End Waterway Guide (referred to throughout the attached letter). The extract needs a few more revisions as I have also been busy researching two buildings in Stour Road (between H Forman & Son and Stour Space). Both have been omitted from the proposed local listing; and one referred to briefly in the attached letter, under page 25 Stour Road Cluster. In your letter please add your support for these two buildings to be added to the local list. Both were used from about 1953 to 1984 by a manufacturer of printing machines and printing presses. The engineering workshop retains its original steel gantry beams (for an overhead travelling crane) and is now a rare and important surviving example of its type in London. Please do your best to meet the deadline or write as soon as possible after 21st February.